Justin Beiber is the worst. He&apos;s a little man-child who&apos;s awful in so many ways. His latest terribleness is inexcusable and the #FreeBeiber hashtag that has trended throughout social media is sickening. And even though some Beliebers are standing by their idol, not every fan is putting up with his latest antics. One 8-year old girl from New Washington, Ohio, has had enough. Serafina — a second grader at Buckeye Central Elementary — was a die-hard Beiber fan since she was 3, but lost faith in him after his drunk driver arrest. Ami, Serafina&apos;s mother, took Justin&apos;s incident to teach her daughter about drunk driving and the 8-year old took pen to paper in hopes of helping the pop super star. "I used his arrest as an opportunity to talk to her about good and bad choices," Ami told Fox News. "I am hoping that Justin Bieber will somehow see or hear this." I&apos;m very disappointed. It breaks my heart that you were in jail for just one night. I loved most of your songs. I dance to them a lot! So many things have changed this year. This is the biggest one yet! Why did you do it? Why did you race cars? What made you do it? Didn&apos;t you know it was a bad thing to do? You had such a great life! I&apos;ve read your books and watched your movies. You had something special. But you gave it up for drugs. My whole life I have been warned about drugs! And now my idol has started taking them! There are many drunk people in the world and you have become one of them. That&apos;s sad to me! I think you should be disappointed in your self. Just take a minute to think about what you did. After his string of incidents last year, it&apos;s at least somewhat heartening to see that not all of his fans are willing to put up with his antics. But this is just one fan. Millions of others are standing by their boy and clamoring to #FreeBieber. Simply put, that&apos;s just terrible. 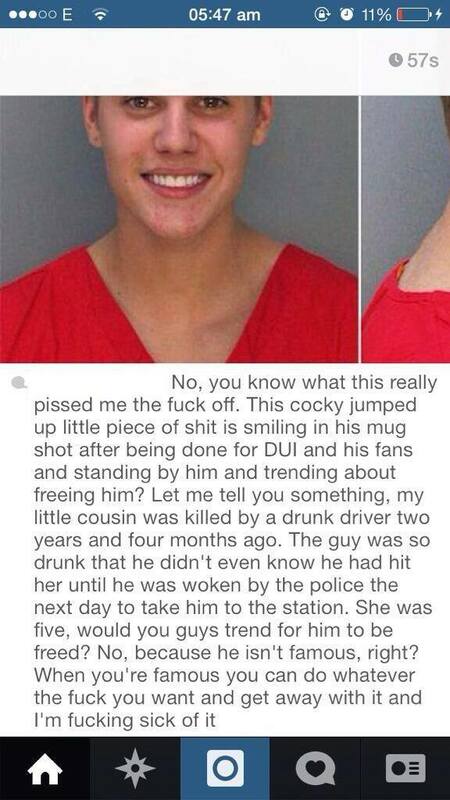 What Justin Bieber did was wrong and he should be punished. #FreeSoAndSo should be used when someone is wrongfully arrested or convicted, not when he&apos;s just famous, and anything else is just a shameful mark on our pop culture-obsessed society. This Instagram post sums it up fairly perfectly.